We have run A Level days for pupils studying community languages. You can download the materials used for both AS and A2 pupils. The National Networks for Interpreting and Translation and Routes into Languages South West are delighted to invite all sixth-form and undergraduate students to attend the annual Career's Event on Wednesday 27th January 2016 at 2 - 5.30 pm at the University of Bath. Guest speakers include representatives from the National Network for Interpreting and International Court of Justice and Bath alumni. This event is open to all sixth-form and undergraduate students. Year 11 students are also welcome to attend. Attendance is FREE but prior registration is required. Please download the draft programme below. To register for your FREE place, please email your name, organisation and contacts details to Steven Wonnacott: S.Wonnacott2@bath.ac.uk Alternatively, please use the registration link above. Do you think you could write a song or rap in a foreign language? 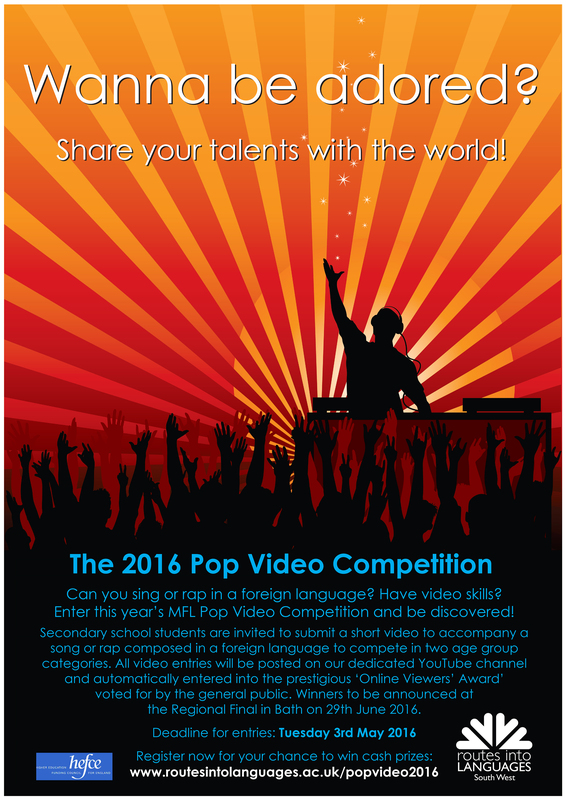 Do you have the IT skills to make a video to accompany your song? If so… this competition is for you. The Routes into Languages South West is inviting you to submit a short video, animated if you prefer, to accompany a song or rap, which you have composed in a foreign language. It has to be an original song or can be loosely based on an existing tune. The competition is open to students between the ages of 11-18 in full time education in all regions across the UK. We will videostream your video on the Routes into Languages South West YouTube channel. And there is a special prize – ‘The Online Viewers' Award’ (decided by the general public) - which will be awarded to the winning entry in each region as well as to the overall national winner! You will have a chance to vote for your favourite video after the closing date. The details about it will be posted on our YouTube website before the closing date. Winning entries will receive a prize of £100 and a trophy. All participants will be given certificates of commendation. To view the entries from previous years please visit our YouTube RiLSouthWest channel. For more information and for rules of the competition please download the flyer below. To enter this competition please submit your video entry together with your completed entry form (please download below) via https://www.wetransfer.com/ to I.Holdsworth@bath.ac.uk by 10 am Tuesday 3rd May. Please read carefully the rules of the competition on page 2 of the competition flyer (please download the flyer below) before submitting your entry. The North-East region will host the next #RoutesLive webinar Routes into Language Teaching on Friday, 23 October 2015, 13:00-14:00.